New Jersey voters displaced by Superstorm Sandy can now vote by email or fax, or may cast a provisional ballot at any polling place in the state, according to the state's top election official. Meanwhile, in New York City, the board of elections has decided to relocate 60 polling sites. Both states are still struggling to recover after the storm last week devastated some communities in the tri-state area. 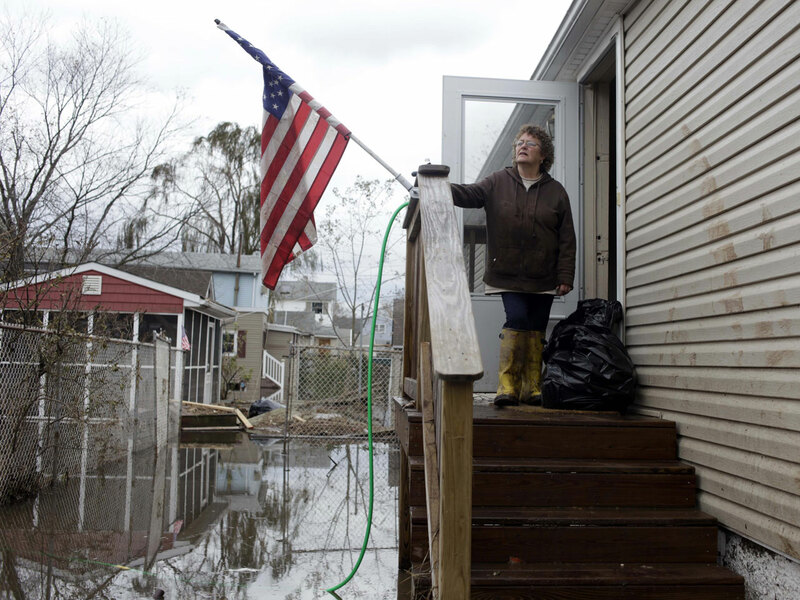 More than 122,000 New York, New Jersey and Connecticut residents have sought out federal assistance in the wake of the storm. Last week, New Jersey Lt. Gov. Kim Guadagno issued directivesthat eased some restrictions on absentee voting and voting by mail, but the directives she issued early this morning go even further. Any New Jersey voter displaced from their primary residence because of the storm will be considered an "overseas voter" and can apply for an absentee ballot by email or fax as late as 5 p.m. on Election Day, Nov. 6. If the voter's county clerk approves their application, the voter will receive a "waiver of secrecy" and a ballot either by email or fax, which they must return by email or fax no later than 8 p.m. on Election Day. Federal law allows overseas voters to cast ballots via email as a last resort. New Jersey officials are "trying to use a system that has been put in place as a failsafe in a different context," explained University of California, Irvine professor Richard Hasen, an election law expert and the author of "The Voting Wars." Hasen said he's not aware of any other state that has allowed voters who are not overseas to cast email ballots. According to computer science experts, he said there's a "legitimate concern" that email ballots could be hacked or lost. "There's all kinds of problems with it," Hasen said. "The question is, do you use a fallible system system like email voting or you disenfranchise [these displaced voters]. Given that choice, it seems like this is the right thing to do." Rather than cast an email ballot, a displaced New Jersey voter can also cast a provisional ballot at any New Jersey polling place, Guadagno said today, though the ballot must be counted in the board of elections in the voter's county of registration. Guadagno also said that any mail-in ballots received by Nov. 19, as long as they are postmarked by Nov. 5, will be accepted. She also ordered county clerks to prepare for a large number of requests for provisional and emergency ballots. New Jersey, a solidly blue state, has never had a voter turnout rate below 70 percent in a presidential election year, but turnout could be lower because of the storm, the New Jersey Star-Ledger reports. About two months after the Sept. 11, 2001, terrorist attacks, the state saw fewer than 50 percent of voters turn out for a gubernatorial election -- a new low in the state's modern history. In New York City, the board of elections early this morning listed the 60 polling places that will be relocated because of Sandy. Twenty-eight of them are in Queens and 24 are in Brooklyn. Three polling sites in Manhattan and three in the Bronx will be relocated, as will two on Staten Island. In New York, if less than 25 percent of registered voters turn out on Election Day, state law allows for an extra day of voting.